Every waterfowler has a preference as to how they hunt. Whether it is in the field, over water or off the road; they all find success. Puddle jumping is fun, but the most adrenaline filled experience is typically reflected upon having a flock of Canadas locked up on top of you, thousands of snows stacked up for days or even a tornado of mallards pouring into your favorite honey-hole. Getting into these situations are all accomplished through a great presentation with your decoys/calling and also your ability to remain hidden. We have put together a selection of some of the best options available so you are able to get closer and create the most memorable experiences this season. Layout blinds are typically the most common form of blind for field hunting. These are especially effective for the mobile hunter who is constantly on the move from early to late season. Multiple brands provide different models and styles to fit different situations. The two most crucial designs that must be considered are the profile and durability of the blind. The profile is less important when hunting late in the season in corn and bean stubble fields, but it is important earlier when hunting low cut crops. You have the option to dig your blind down to eliminate some of the shadow cast by your blind, but it is more efficient to have a lower profile. Durability in this case references the strength of the material on the underside of your blind to withstand snags and tears from rough surfaces and rocks. A second design to look for a waterproof base. This base allows the blind to be partially submerged in mud or water. This is especially useful along water edges and wet fields. Be picky when choosing your layout blind. The perfect blind for your style and situations you may encounter is out there! Bale blinds are as simple as they sound. They can be purchased or built. This blind is effective year round in farm country where you can set them up alongside other hay bales or they can stand alone. The best feature of these blinds is that they can be built to fit any sized hunter and their partners. This, along with the fact that these blinds are also effective in the pursuit of big game, make them one of the best options available. The only downside is that they take time and resources to build or purchase. Do not forget about your best fiend in the field as well. Your dog can lay on the inside of your blind at your feet or there are specific dog blinds and stands for in the field and on the water. Although they may keep you warm inside the blind they can track mud and water. This is avoidable with their own blind and some training to prepare them for hunting situations. Concealing yourself while hunting water can be a challenging and exciting task to conquer. So often we get caught up in the fact that in most cases we are hiding behind reeds where we are sure they can’t see us! But we forget that the birds are flying over us, which means we are exposed to them flying overhead. Hunting from a boat creates a large gap in the reeds that makes the boat and the hunter stick out like a sore thumb. There are many ways to conceal yourself while hunting from the water. Here are a couple ways to make sure you are concealed from birds. Ditch the boat. If it is an option leave the boat in the reeds a good distance from where you are hunting or break down some reeds to cover up the boat. Find a good spot in the water next to the reeds and tuck yourself in nice and tight. You will have a perfect view of birds coming in to finish and they won’t be able to see you tucked into the reeds. When the time comes to take the shot, mount your gun and take a step out if you need a better line of sight. This is one of the best options because it keeps you completely concealed and takes little effort to get in position. The water can sometimes be too deep where you want to be. A boat is the best option to get within range. Building a basic blind out of your boat is rather simple by using PVC or Conduit. The most important part when building this blind is ensuring you are concealed by using manufactured sheets of reeds. These usually come in 4′-8′ sheets and can easily be placed on the blind.They work really well in concealing a boat as well as the hunter. Not every situation calls for the standard blind, comfy waders or a boat. Waterfowl are tough birds to follow and their trail does not always lead to an easy dry field or a slough 100 yards off a dirt road. Be prepared for complication and for different situations. Certain situations may not allow the use of a blind in the field. The fields can be too wet and by the time you hauled your decoys out you are too exhausted to drag the blind along, or the field is cut to short to allow a blind to be concealed. When this occurs having top of the line camouflage and covering all exposed skin is a necessity. This will allow you to lay within the decoys and still remain hidden. If your camo selection does not blend well in most settings a ghillie suit is another great fall back. They provide texture and break up your outline while concealing you into the field. Pit blinds are built with ultimate comfort in mind. This is a permanent blind that is dug into a location on the edge or within a crop field or major travel corridor. These blinds are typically a go to when the migration is in full swing and an all day hunt or a large crew of hunters are focusing on one area. A pit blind is custom built, but they will usually include a bench, storage for each hunter, a heater, an opening brushed in to conceal the hunters and the occasional cook top where meals can be prepped throughout the day. 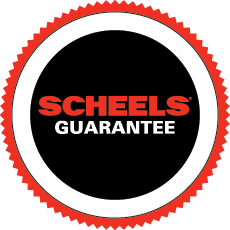 LEARN MORE WITH OUR SCHEELS OUTDOORS TEAM!